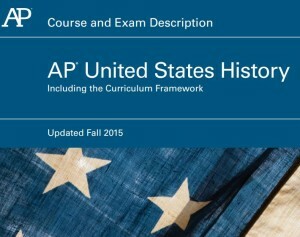 The College Board has just published a revision of its controversial AP U.S. history framework. The revision is designed to meet the concerns of the 2014 framework’s many critics. As one of those critics, I want to give a preliminary response. This is also the first in what will be a series of posts on the new AP U.S. history framework and related issues. Based on a preliminary reading of the Thematic Learning Objectives and the first two historical periods, I would say that the revisions do not allay my concerns about the College Board’s approach to AP U.S. history. The College Board has removed some of the framework’s most egregiously biased formulations, yet the basic approach has not changed. Since the College Board has said that the revised framework will not require modifications to textbooks, there is reason to believe that we are looking at largely cosmetic changes. The textbooks are what students actually see. If the latest revisions won’t change the texts, they can’t mean much. Based on my reading of the first two periods, even if the College Board does call for textbooks to be revised along the lines of the new framework, the changes would be trivial. The first historical period (1491-1607), for example, is still shaped by a “three worlds meet” approach descended from the leftist National History Standards of 1994. In other words, the revised framework remains aggressively relativist, avoiding consideration of the deeper cultural sources of Western expansion and success. The emphasis instead is on mutual interaction and influence among European settlers, Native Americans, and African slaves. There was mutual influence among these three groups, of course, but the core story of how the Renaissance individualism, learning, innovation, science, and enterprise sparked a world-changing cultural transformation is evaded. The continuing emphasis on material causes (eg. international trade in new foodstuffs) keeps the focus off of uncomfortable issues of cultural influence and development. used the phrase “American Exceptionalism”—I’ve so far seen little new substance to fill out the meaning of that theme. There is still no treatment of John Winthrop’s City on a Hill speech, or of the broader point that the New England settlers saw their venture as a model for the world. New England town meetings are briefly referenced, yet without any explanation of how this led to a tradition of localism in America quite different from Europe. Merely referencing the words, “American exceptionalism” isn’t enough. To be meaningful, the concept has to be filled out with powerful examples. Clearly, the College Board is worried about competition. Its initial response to critics was to dismiss their concerns. Only after I raised the issue of competition here at NRO—and especially after the Georgia State Senate passed a resolution calling for competition in AP testing—did the College Board change its tune, acknowledge errors, and promise revisions. Whether for self-interested motives or not, of course, it’s nice to see that the College Board has removed some of the most egregious and controversial formulations from its framework. Unfortunately, the revised framework’s overall approach continues to give short shrift to important themes in American history. The only real solution is to nurture competition in AP testing. Whatever limited improvement we’re now seeing is due to the specter of competition. Only competition in AP testing can restore choice to the states and school districts that by rights ought to control their own curricula. Without competition, whatever the College Board says, goes. Competition is the real issue. No company likes rivals, but the College Board is more than an ordinary monopoly. There is an ideological as well as an economic motivation behind the College Board’s actions. Run by Common Core architect David Coleman, the College Board is committed to creating a de facto national curriculum. That is why it is slowly but surely substituting lengthy and highly directive curricular frameworks for brief topical outlines in every single one of its AP courses. As a program of federal subsidies has massively expanded the population of students taking AP courses, the College Board has seized the opportunity to gain effective control of the nation’s high school curriculum by issuing detailed teaching frameworks. This amounts to an end-run around the states and school districts that by rights ought to be in charge of what’s taught in the schools. In the absence of competition in AP testing, the College Board will become a kind of unelected national school board. The APUSH revisions, in my views, are largely an effort to silence public criticism and prevent competition and choice from emerging in AP testing. One of the strongest indications that this is the case is the AP European history framework, brand new this year. The new European history framework is egregiously biased in all the ways that the 2014 AP U.S. history framework was. It downplays national identity, focuses overmuch on the evils of colonialism, is hostile to capitalism, downplays the excesses of the left and the problems of communism, and gives short shrift both to religion and to the sources of the classic Western liberalism. The new AP European framework makes it clear that nothing in the College Board’s approach to history has fundamentally changed. The College Board continues to be under the influence of leftist historians. If opposition to the U.S. history curriculum dies down, the College Board’s favored historians will eventually pull the APUSH curriculum even further to the left than it was in 2014. Again, this is a problem that only competition can solve. As so often happens, history is repeating itself. In 1994-95, widespread initial condemnation of the National History Standards (NHS) for leftward bias brought forth a revision in response to critics. That revision, which removed the most biased phrases and made a few somewhat more substantive revisions (especially to the controversial section on the Cold War), split the opposition to NHS. Some critics quieted down, while others said that nothing fundamental had changed. The College Board’s declaration that no textbook changes are needed to accommodate its revisions is the tip-off that the same thing is happening again. And as noted, even were the College Board to loudly demand that textbooks must conform to the changes, there is very little to change. Essentially, the College Board appears to have done what the NHS revisers did: cut out the most controversial phrases, tweaked the worst sections, but done little to create a genuine alternative approach. Only competition in AP testing can restore meaningful choice to the teaching of history. Whatever positive changes have emerged in the College Board’s revisions are due to the specter of competition. Competing companies with competing frameworks shaped by top-flight professors from competing schools of thought would keep each other honest and restore choice to the states and school districts that by rights ought to be in charge of what their children learn. New York State Exposed Education: Are Common Core Tests Graded Fairly?